We are upheld by a group of exceedingly prepared specialists and are effectively giving CO2 Storage System/Transport Vessels. 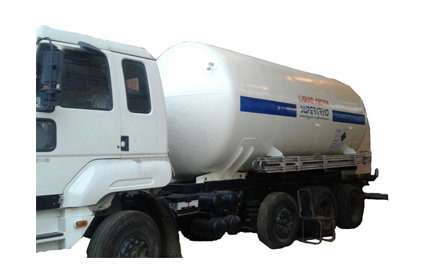 With true aims to safeguard and elevate our notoriety in the universal market, we are delivering a definitely outlined scope of Liquid CO2 Transport Tank/Storage System. Offered capacity frameworks are reasonable for putting away gasses at most reduced temperature of - 20 degree Celsius. These capacity frameworks are produced by our specialists using the best innovation and segments as per the standard of industry. Offered Storage Systems can be benefited from us at market-driving costs in a conferred time allotment. Our pressure vessels are tried by our in-house quality and welding auditors before they even leave our premise. Pressure reducing stations with by-pass line. Pressure gauge and switch provided for automatic control of the pressure inside the vessel. Differential pressure liquid level indicator provided to determine the liquid level in mmWC with a choice of level chart which indicates the tentative quantity of the liquid in Kgs. Safety valves (2 Nos.) are provided each having sufficient discharge capacity when there is excessive pressure accumulation. Isolation valves (2 Nos.) provided to control/bar the flow. 200mm thick PUF insulation with aluminium sheet barrier. 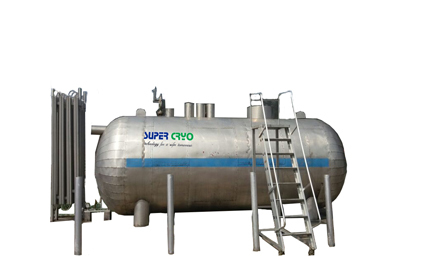 Vacuum insulated double-walled cryogenic gas storage tanks/Vessels as alternative options. Liquid Carbon dioxide transfer pump with piping for cylinder filling purposes. The entire framework is solid with easy access and maintenance of the components. CO2 Vapour Condensing Units on storage installations to provide no-loss storage.